We are approximately 1,400 miles from Southampton, England following the route of The Titanic and warily scanning for icebergs. Which one of these doesn’t belong? Me. Outside. Deck. Chaise Lounge. North Atlantic Ocean. 52 Degrees. January. Sun. Colder then Florida? If you guessed none… bingo! Read it and weep denizens of North America. I never would have expected to see one day like this, let alone two, during this crossing. It’s almost noon (9 AM EST) as I write. We have been nudging our clocks ahead one hour each night so when we arrive in England we will be in the Proper time zone. We mustn’t annoy the Queen. The waves have grown to 20+ feet and are smashing into our starboard side (that the right side for all you nautically-challenged types) which translates into a rolly polly ship. The Commodore (many, many, pay grades above Captain) tells us that these waves are mere shadows of what “batted about” the Queen Victoria yesterday. He also reminded us that our day will surely come. Hear this in your head, spoken in the most delightful british accent, and it’s impossible to get perturbed. Americans are the minority on this segment. It’s mostly brits, and many are getting off in Southhampton. They just wanted to “cross the pond” and overeat. Speaking of overeating… my charming baby brother, Brian, suggested that Steve and I log our weight gain along with our experiences. Thanks Bri. NOT. We have remained true to our goal of working out in the gym every day while at sea. Okay… it’s only been 4 days, but a commendable start. Oh, except that Steve skipped this AM… too drugged on Dramamine to move. Better safe then, well, you know… (retching sounds… ). From my perspective on the 10th deck, the waves just don’t seem that big. BUT… if you stare at them from the 3rd deck for too long… you will likely revisit with your last gourmet meal. From down there, you get occasional peaks of horizon behind an undulating wall of boiling water. We have been traveling at 23 Knots since leaving New York – that’s pretty darn speedy. Our stateroom is just about mid-ship, which is the least rocky spot. Location. Location. Location. Let’s go back to January 4th for a moment… our departure day. 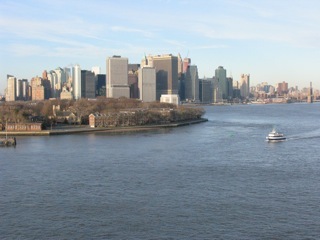 I took the photo below from our stateroom balcony – looking back at Manhattan. We pulled out around 6 PM with several police boats escorting us towards the mighty North Atlantic. We enjoyed a spectacular view of the Statue of Liberty, and eventually slid under the Verazano Bridge, which we didn’t clear by much. I could see that the underside was in desperate need of a paint job. For you trivia fanatics… the QM2‘s overall height during the design process was determined by the clearance needed for this one little ‘ol bridge in New York.